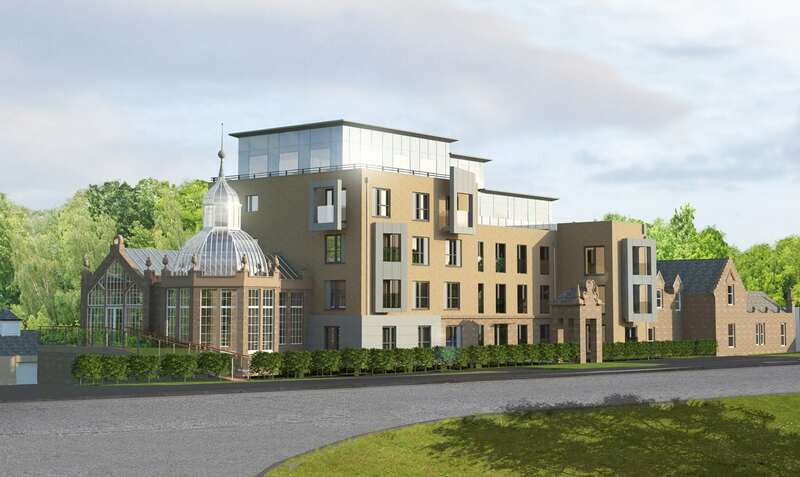 Muir Homes has begun the careful work to convert the Grade A-listed building, Broadstone House in Port Glasgow, into a collection of beautiful luxury apartments. This iconic property was built in 1870 as a Scottish Renaissance mansion with an architectural style based on Newark Castle. In 2004, the house was badly damaged by a deliberate fire and part of the roof and upper floors have since collapsed. Muir Homes has been working with Inverclyde Council to develop a design solution for 27 new apartments within the shell of the original building that retains as much of the iconic structure as possible. The stone-framed conservatory and striking glazed dome and cupola roof will be retained and restored to create a completely unique new property that is sympathetic to Broadstone House’s past. As a result of the fire damage in 2004, some parts of Broadstone House must be demolished to make way for the new development. This careful process has begun and specialist contractors will carry out much of the work by hand, to ensure the original stonework can be reused elsewhere within the development. In autumn 2016, the refurbishment of Broadstone House will commence alongside the construction of the apartments making up the majority of the development. This page will be updated with more information as the project progresses.